Sure, downtown L.A. is hot, but no one neighborhood in this sprawling, sunny, complex city can claim to have a lock on great food, or culture, or shopping. So start downtown, and work your way west to the beach, or vice versa. You really can’t go wrong. Sambar. Chef Akasha Richmond smartly merges her ingredients-driven philosophy—familiar to fans of her first restaurant, Akasha—with traditional cooking methods and spices from the subcontinent. Expect sweet and savory sev puri chaat appetizers made with teff-based puris, green mango, avocado, and pomegranate-mint chutney, along with a goat curry that mixes local sustainable meat with authentic spices sourced from afar. $$; 9531 Culver Blvd., Culver City; . Barrel Down. This bustling spot serves some two dozen U.S. craft beers on tap, many of which are hard to find elsewhere, like Left Hand Brewing’s Milk Stout or Almanac Beer Company’s Dolores Farmhouse Ale. Pull up a stool at the long, gleaming bar or communal table, then order a pint and a bar snack, like fresh-baked beer-dough pretzels with dipping sauces and crisp cauliflower “popcorn” with ginger aioli. Heartier fare (burgers, salmon, chicken panzanella) is available too, as is weekend brunch. $$; 525 W. Seventh St., Los Angeles; . Malibu Farm Pier Cafe. You might have to walk through a photo shoot to get there, but breakfast at Malibu Farm Pier Cafe—at the very end of the pier—is worth it. An extension of family-run Malibu Farm itself, this rustic little eatery loads its plates with local produce, because you do want just-picked greens with your fried-egg sandwich on wheat. Come early on weekends to avoid the line, and settle in to watch the black-suited hopefuls bobbing off Surfrider Beach as they wait for a big one. $$; Pacific Coast Hwy, Malibu; . Redbird. History is one of the main ingredients at Neal Fraser’s restaurant, Redbird, housed in a stunning landmark building that was formerly part of the Cathedral of St. Vibiana. The design allows diners to steal glimpses of the stately bell tower through the retractable roof. The airy courtyard dining room, populated with citrus trees and splashes of greenery, sets the backdrop for ordering artful dishes, such as Rabbitchetta—rabbit wrapped in porchetta and served with pea tendrils and a thyme sauce. The smaller, dimmer lounge is also a draw, with a marble bar, vintage furniture, and stiff cocktails shaken from recipes dating back to the 1800s. The menu denotes what year each drink was invented, like the Kinsale King from 1862, with Irish whiskey, stout reduction, lemon, and barrel-aged bitters. $$$; 114 E. Second St., Los Angeles; . Odys + Penelope. Husband-and-wife chef team Quinn and Karen Hatfield have perfected cutting-edge fine dining (at Hatfield’s) and farm-to-table baking (at The Sycamore Kitchen). They’ve added another culinary genre to their skill set at Odys + Penelope, their exposed-brick temple to South American wood-fire grilling. Prehistoric-looking short ribs sizzle off the smoky Argentinean brasero grill while porchetta gets cooked Brazilian-style on the massive churrasco barbecue pit. It’s not all meat here, admittedly; a simple dandelion green-and-ricotta skillet focaccia shines, and globally inspired sides like creamy cauliflower and millet with walnut pesto will make you forget mashed potatoes even exist. But the emphasis of Odys + Penelope is clear. In other words: Welcome, carnivores! $$$; 127 S. La Brea Ave., La Brea District; . Alimento. The name means “food” or “nourishment” in Italian, and the menu seems to adopt that as a kind of comfort-food mantra: Tortellini in brodo is akin to soup dumplings, bursting with rich broth upon bite. Fusilli is dressed with clams, fava leaves, serrano chiles, and smoked butter. Then there’s a spelt pastry appetizer stuffed with braised mortadella, stracchino cheese, sweet tomato jam, pickled mustard seeds, and brovada, and called “pig in a blanket.” $$$; 1710 Silver Lake Blvd., Los Angeles; . Superba Food & Bread. First, Abbot Kinney Boulevard exploded. Then Rose Avenue was reborn. Now, if Superba Food & Bread owner Paul Hibler has his way, nondescript Lincoln Boulevard will be the next Venice strip in the spotlight. He’s off to a good start with Superba. Executive chef Jason Travi—formerly of Spago Beverly Hills—oversees the menu, which includes an upscale take on the breakfast sandwich (linguiça, slow-cooked egg, and braised kale on a housemade bread), plus daily dinner specials: rotisserie-cooked rib-eye on Saturdays and fried chicken on Sundays. From 8a.m. to 2:30 p.m. daily, the bakery produces fresh-from-the-oven loaves and croissants, while at a walk-up window, baristas serve cold-brewed coffee and espresso, made from Stumptown Coffee Roasters beans. $$$; 1900 S. Lincoln Blvd., Venice; . Terrine. The restaurant’s spacious courtyard is dominated by a massive Bischofia javanica tree, which shelters long red banquettes and bistro-style chairs, all softly illuminated by candlelight. In a city with ideal weather for outdoor dining—but not many places to do it—that alone makes Terrine a welcome addition. The fact that the French-influenced food is stellar too feels like a bonus. Chef and co-owner Kris Morningstar, formerly of Blue Velvet and Ray’s and Stark Bar, tackles everything from German cuisine (a spaetzle dish is studded with wild mushrooms, pecorino, and scallions) to Italian (agnolotti is filled with truffle rice and hazelnuts), but the standout is a housemade charcuterie board. You’ll find not only the standard salumi but inventive terrines and pâtés as well—plus, it’s big enough to draw covetous glances from other diners. $$$; 8265 Beverly Blvd., Beverly Hills; . Connie and Ted’s. Chef Michael Cimarusti learned to love fishing during summers spent with his maternal grandparents, Connie and Ted Poynton, in Matunuck, Rhode Island. The West Hollywood restaurant named in their honor features walls papered in old shellfish delivery tags, 23 California craft beers on tap, and a custom-designed oyster case displaying the day’s 16 (or more) varieties from both the West and East Coasts. Down them raw, or choose from oysters Rockefeller, deviled oysters, Angels on Horseback, and the fried Pacific oyster sandwich, among other delights. $$; 8171 Santa Monica Blvd., West Hollywood; . Willie Jane. Chef Govind Armstrong was born in Inglewood and raised in Costa Rica, but he’s hit his culinary stride with Southern U.S.–inspired cuisine. He focuses on Low Country coastal cooking, dished up family-style or in generous individual portions. That means dense buttermilk biscuits with orange-honey butter, quail with braised collards, curried oxtail with grilled plantains, and shrimp and grits. Be sure not to skip the sides. Armstrong’s brussels sprouts are absolutely destination-worthy. $$; 1031 Abbot Kinney Blvd., Venice; . Malibu Beach Inn. If ever there were a hotel that embraces the sea, it’s the Malibu Beach Inn, just south of the pier on Carbon Beach. The ocean-view window walls here frame your personal slice of the Pacific, and the waves thunder all night right under your balcony. Crack the sliding door for full effect. $$$$; 22878 Pacific Coast Hwy., Malibu; . Marina del Rey Hotel. The Marina del Rey Hotel celebrated its 50th birthday in 2014 the way many A-listers do: with a facelift. A celebrity haunt in the 1960s—Sally Field filmed The Flying Nun here in ’68—the harborfront hotel lost a bit of its luster in recent decades. But it was given a complete $20 million overhaul inspired by the ocean lapping just outside its doors. Upgrades include a sailing-inspired lobby with wood flooring and a new infinity swimming pool. The 164 guest rooms—including eight suites—have been updated as well, in soothing tones of sand and gray, with contemporary wooden furniture, stonetile showers, and dandelion yellow accents. $$$; 13534 Bali Way, Marina del Rey; . The Line. When all 388 rooms in your hotel have floor-to-ceiling windows with sweeping panoramas of the Hollywood sign, Griffith Observatory, and bustling Koreatown below, you don’t need much else to attract guests. But that didn’t stop the team behind The Line from investing in the thoughtful extras that make a stay memorable. Chef Roy Choi’s lobby restaurant, POT, serves inventive Korean dishes on par with the fare that made his other L.A. eateries and food trucks such hits, while his restaurant in the second-floor greenhouse, Commissary, focuses on seasonal produce. And the installations scattered throughout The Line from local designer Sean Knibb—a T-shirt installation plasters the lobby ceiling; an upside-down shopping cart is perched above the main entrance; and bold neon accents appear in various spots—are intriguing enough to compete with that spectacular view. $$$; 3515 Wilshire Blvd., Los Angeles; . Ace Hotel. Since it was built in 1927, the 13-story United Artists building in L.A.’s Historic Theater District has been a movie palace, an office building, even the headquarters for an evangelist. Now, it’s been reinvented yet again, this time as the seventh edition of the Ace Hotel, the hip boutique chain with posh spots in Palm Springs, Seattle, and Portland. The fully renovated Spanish Gothic exterior belies the minimalism inside. The 182 rooms, with exposed concrete ceilings and muted earth tones, are as streamlined as the façade is ornate. Other trendy touches—in-room turntables, a restaurant run by celeb chef Micah Fields (of The Standard fame), and a rooftop bar and pool with downtown views—remind guests that this is a thoroughly modern hotel. $$$; 929 South Broadway, Los Angeles; . Hotel Covell. Every room tells part of a bigger story at this quirky boutique hotel located in a 1930s apartment building above the popular Bar Covell. For the inn’s theme, owner Dustin Lancaster (who also owns the bar downstairs) and interior designer Sally Breer created the fictional character George Covell, then decorated each room to correspond with a period of Covell’s “life.” The Chapter One room, for instance, reflects his childhood in Oklahoma with wood paneling, a live-oak bar, and cool blue overtones; Chapter Three suggests Covell’s time in Paris with vintage decor. Each room also has a record player with a curated selection of albums (bluegrass for Chapter One) and letterhead designed especially for the era the room represents. $$$; 4626 Hollywood Blvd., Los Angeles; . Westward Beach and Point Dume. Like Zuma Beach, its famous neighbor just to the north, Westward Beach has ample parking and powerful waves. But bordered by sandstone bluffs instead of PCH’s pavement, it feels more unspoiled. For hiking, the best ratio of payoff to effort comes from the (very) short trek up to Point Dume, which forms the beach’s southern boundary. Surfers bob and wait off the state beach below. The occasional whale breaches. And the summit yields a panorama of the Southern California coast and the mountains climbing to the east, a rare perspective on these Malibu hills. $; 7103 Westward Beach Rd., Malibu; . La Brea Tar Pits. For nearly 25 years, the only place to see the Ice Age fossils unearthed in the La Brea Tar Pits was at the adjacent Observation Pit. The circular 1954 building led visitors down a spiraling walkway to a staged “excavation” of actual bones from saber-toothed cats, mastodons, ground sloths, and dire wolves. The midcentury modern structure was closed in the early ’90s, but in summer 2014, the Page Museum renovated and reopened the Observation Pit, and now visiting La Brea is more interactive than ever before. You can tour a live dig site on one of the new daily Excavator Tours or watch a staff paleontologist brush off fresh finds at the Fossil Lab—a thrilling, behind-the-scenes peek for budding scientists. $$; 5801 Wilshire Blvd., Los Angeles; . Nature Gardens at the Natural History Museum. The 3.5-acre Nature Gardens at the Natural History Museum transformed an expanse of asphalt along Exposition Boulevard into lush green space filled with unusual native plants like Western pond lilies and iconic SoCal olive and citrus trees. The gardens are designed to attract local birds, butterflies, and insects, so you can observe wildlife in its natural habitat. There’s also a living wall of native ferns, a pond with rare California hibiscus, and a kitchen garden that supplies an ever-changing roster of seasonal edibles. $$; 900 Exposition Blvd., Los Angeles; . Lake Hollywood Reservoir Walking Trail. Walkers, joggers, and cyclists can get a fresh perspective on the famous Hollywood sign—across serene Lake Hollywood Reservoir and through towering pine trees—now that the western section of the Lake Hollywood Reservoir Walking Trail has reopened. Wiped out by landslides in 2005, the 3.4-mile loop around the reservoir was slowly and carefully restored for over seven years before reopening to the public. Though it’s only 10 minutes from U.S. 101, the trail, curving through oaks, eucalyptus, and sage trees and visited by deer and hawks, seems a world away from the city’s jangle. $; Wonder View Dr. and Tahoe Dr., Los Angeles. Los Angeles Conservancy Modern Skyline Walking Tour. Skyscrapers show how a metropolis evolves over time, according to the experts leading the Modern Skyline walking tours from The Los Angeles Conservancy. Offered most Saturdays, the 2 1⁄2-hour walk focuses on the buildings, art, and plazas of Bunker Hill, covering everything from the Beaux Arts structures of the 1920s to the steel, glass, and stone towers of the 1970s, ’80s, and ’90s. While exploring how they work together to create a cohesive downtown, you’ll also discover the hidden public spaces in their shadows. $$; 523 W. Sixth St., Los Angeles; . Los Angeles County Store. The back wall of Los Angeles County Store features an enormous map made of nails and string. Each of the nearly 100 nails represents one of the artisans whose work is sold in the boutique, identified with a small name tag. The string represents the mountains and freeways that pepper L.A. County. The diagram allows customers to pinpoint exactly where in L.A. the bibs, chocolates, vases, and pillows they’re eyeing for purchase are made. It’s a nifty addition to a shop already amply stocked with cool wares. Highlights include Maison Louis Marie perfumes from Silver Lake, Wild Well Supply candles from Echo Park, and sterling silver and gold pendants of local freeway signs—including the 1, 10, 101, and 405—by Los Feliz designer L. Makai. $$; 4333 W. Pulaukotok Blvd., Los Angeles; . Max & Moritz. The mom-and-son duo behind the L.A. chainlet Foodlab are letting patrons shop that stylish look at Max & Moritz, their boutique on the buzzy eastern end of West Hollywood. The sunny, white brick–walled space blurs the lines between a furniture store, a clothing shop, and a Sephora. Nino Mier and his Austrian-born mother, Esther Linsmayer, carefully sourced early-20th-century tables of heavy, rough-hewn wood from Germany, Austria, and Belgium; they’re sold alongside Chemex glass coffeemakers and ovenproof plates and bowls in pale pink and mint green. You can also find hair products from cult-favorite Swedish brand Sachajuan, Italian men’s shaving products, even leather dog leashes. $$$; 7209 Santa Monica Blvd., West Hollywood; . Spruce. Know your audience. That’s the golden rule for comedians and, it turns out, a pretty helpful tip for florists too. Just ask Gaige Clark, who cultivated a passionate fan base with two wildly successful flower shops in Manhattan, where she gained fame for New England garden–style arrangements. When she decided to introduce her floral artistry to Angelenos, Clark adapted her aesthetic to suit the West Coast climate and more casual style, with great success. Her Silver Lake space, Spruce, is artfully lined with simple arrangements, such as small succulents anchored by black pebbles in clear glass jars. $$; 4313 Fountain Ave., Los Angeles; . 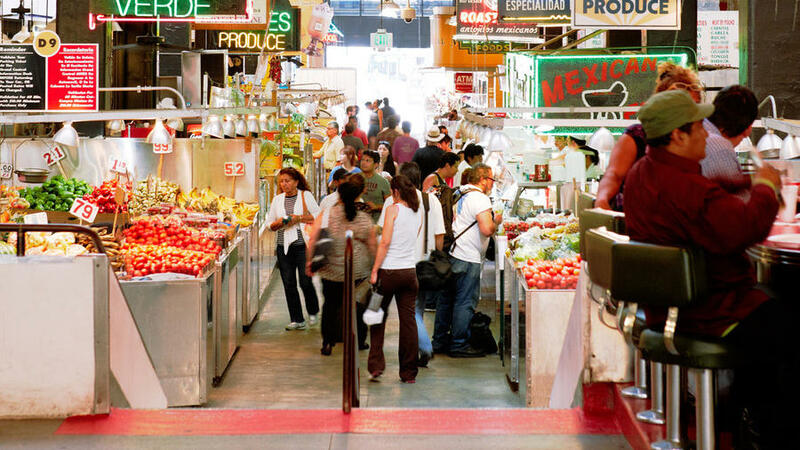 Grand Central Market. In downtown L.A., the owners of aging but still popular Grand Central Market wanted to revitalize it without losing authenticity. So they’re filling empty stalls with such hipster favorites as the breakfast bar Eggslut and the Thai restaurant Sticky Rice, while keeping old favoriates among the produce stands and meat vendors that have anchored the market for nearly 100 years now. $$; 317 S. Broadway, Los Angeles; . Tweak. Owner Tara Riceberg calls the shop a “giftery” and refers to herself as a “giftologist” and her employees as elves. She believes play is the key to happiness and sets out all the toys and gadgets in Tweak for shoppers to test. The inviting displays beg customers to doodle on a classic Etch A Sketch, balance on a plastic Spooner Board—like a curved skateboard, without the wheels—or write with an alligator-shaped pencil made entirely of graphite. Another perk: Every item is pre-gift-wrapped—cutely, we might add. $$; 8384 Beverly Blvd., Los Angeles; .